Losing a member of the family is always hard. 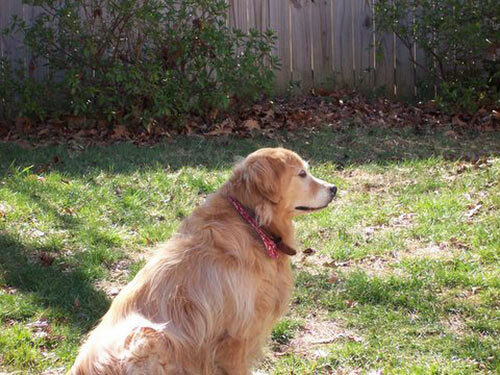 And our golden retriever, Regan, was very much a part of ours. We adopted her when she was just eight weeks old, and had her with us, until she died of complications of cancer at age thirteen and a half. We knew she had been ill for over a year, and we were able to keep her comfortable and happy right up until she made the transition into dog heaven, and I am grateful for that, as well as the many, many days we spent together. Regan inspired many of the pets in my novels. She was my constant companion. My walking buddy. My helper in the kitchen. She will forever be a part of my heart and she will be deeply missed. Below is a photo of Regan, taken at age nine, still wearing her full ‘winter coat’, as she enjoys one of the first days of spring in our backyard….